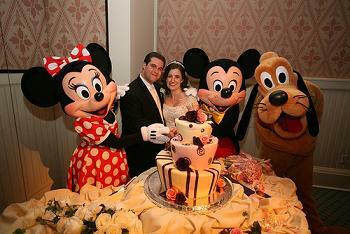 Disney wedding cakes are designed around so many wonderful characters. 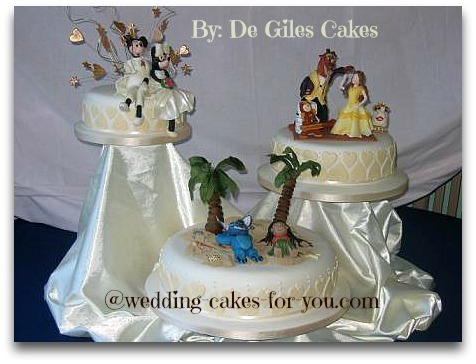 A Beauty and The Beast wedding theme is a perfect choice for a romantic affair. 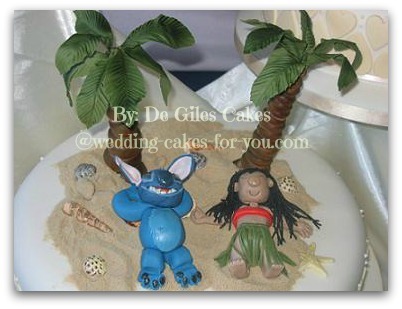 Mickey and Minnie Mouse cake toppers are great and see the cute Lilo and Stitch example below. 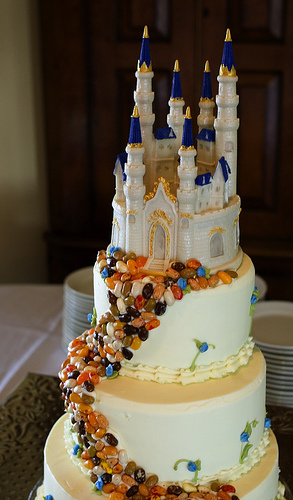 Check out these amazing wedding cakes for a Disney inspired affair. Love the jelly bean pathway to the castle. 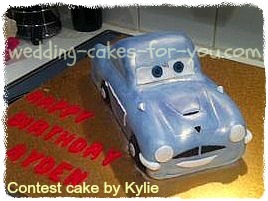 If you want to see more cakes like this one go to castle themes on this site. 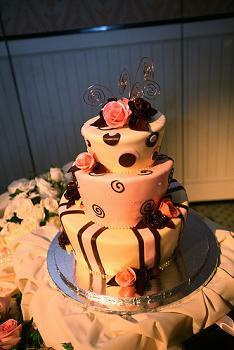 Amazing cakes like these are so much fun. 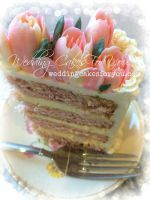 A three tiered topsy turvy fondant wedding cake! It looks like everyone is having a great time. 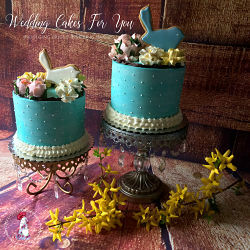 A close up of the whimsical fondant beauty! Our Mad Hatter Cake by *lynne*, on Flickr. 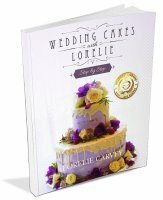 The details include fondant flowers or gum paste flowers. Chocolate roses made of what looks like modeling chocolate. 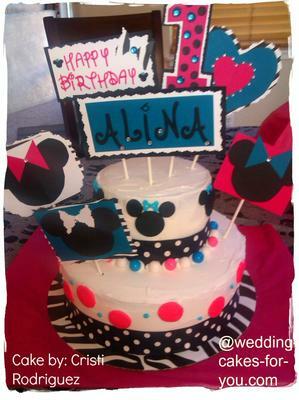 Strips of brown or chocolate fondant and whimsical dots in a pink and brown color combination. 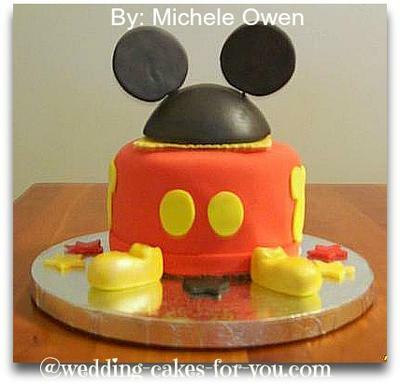 Perfect toppers for Disney wedding cakes. They are hand made from gumpaste. 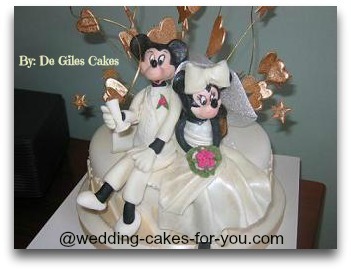 Di Giles was kind enough to send me a few more pictures of this fabulous Disney themed cake. This is the cake in full. 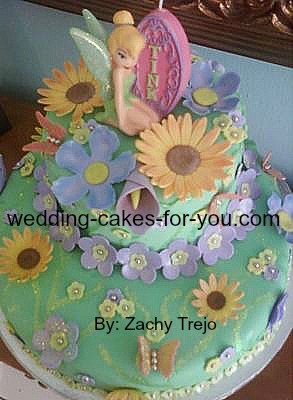 It has three wedding cake toppers, all based on Disney characters. 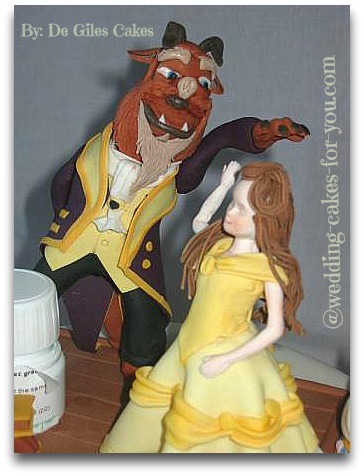 Detail of Beauty and The Beast adorning one of the three cakes. 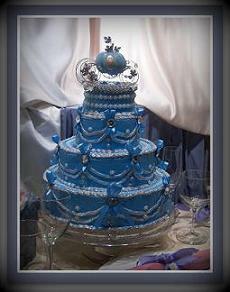 This lovely blue design with a Cinderella carriage is sweet. 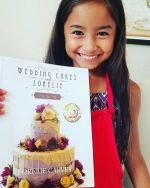 Check out some of the fun whimsical designs on this website. The McMissile cake below would make a GREAT grooms cake. 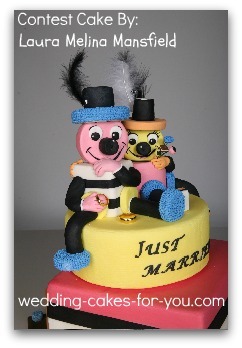 Mr. and Mrs. Allsorts below was shared by a visitor from the UK. I have no clue who these characters are or where they came from, but they are just adorable. 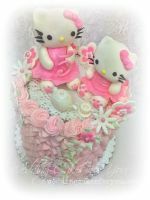 The dummy cakes by Meil Bon Bons are literally unreal. They are for display purposes only. 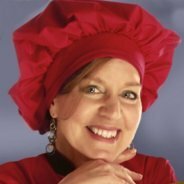 But you can certainly use the ideas from them when designing your own creations. Mickey and Minnie are probably the most popular Disney characters. 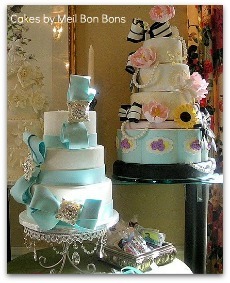 Even though these are birthday cakes, you can adapt the ideas to wedding cakes.